Today would be a perfect day to enjoy Eagle Creek Park in it’s winter beauty. Today would be a perfect day to enjoy Eagle Creek Park in it’s winter beauty. But what is going on this month at our park? 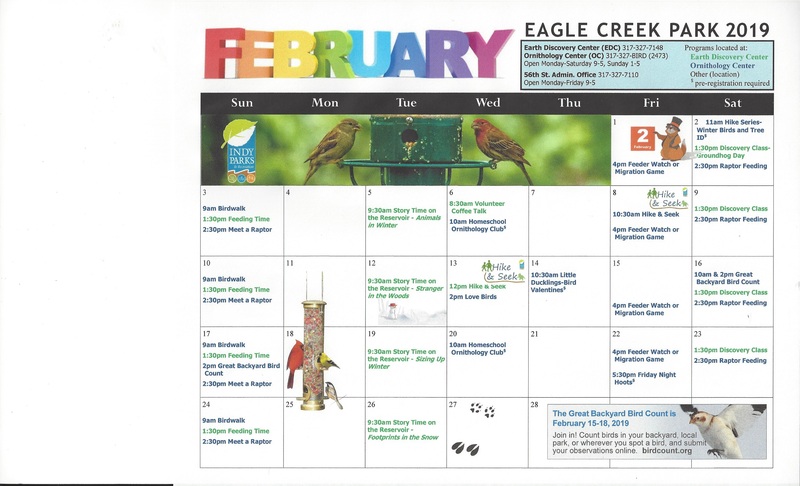 Take a look at the attached calendar and the descriptions of the activities for the month of February. Many are family activities that are both fun and educational. Some terrific ways to learn more about nature. Will we have six more weeks of winter – or is spring just around the corner? 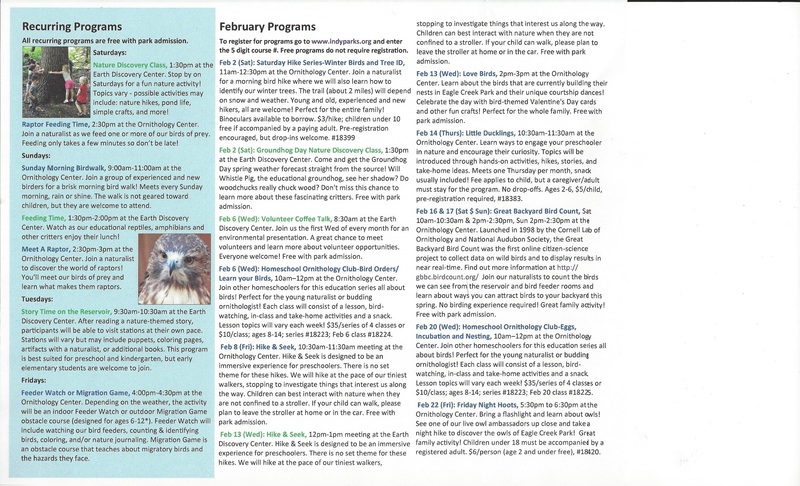 Find out tomorrow, Groundhog Day (Feb 2nd), as Whistle Pig, the educational groundhog at Eagle Creek Park, makes a prediction at the Earth Discovery. Did you know that this tradition was brought to Pennsylvania by the Germans, who had used a badger “in the old country” to predict the weather? The groundhog (also know as a woodchuck or whistle pig) became the animal used here, as they were plentiful. I think most of us hope for a cloudy day tomorrow, as the legend has it, if he sees his shadow it frightens him and he goes back into his hole for six more weeks of winter. However, if he does not see his shadow he spends some time looking around and we will have an early spring. Find out more about this fascinating critter during the Groundhog Day Nature Discovery Class at 1:30 p.m. tomorrow. Free with park admission. Don’t forget that we will be having our first cleanup of the year on Sunday, February 3rd, starting at 1:00 p.m. We will be meeting at the Mayor’s Gardens parking lot (south of 56th Street off of Reed Road). The snow should be melted. Let’s have a really successful cleanup along the greenway and 56th Street! Want to remind everyone that even though the snow should be melting, it still is the homeowners and business owners responsibility to clean the sidewalks that are along your property. Please do clear your sidewalks so that people may walk on them safely and not be in the streets where they could get hit by a vehicle. Attached is our December Crime Report for District 6.